Complications will occur with any operative procedure. The possibility of this must be considered for laparoscopic incisional and ventral hernia repair (LIVH) as well. The most commonly reported of these include: intraoperative intestinal injury (1–3.5%), infection involving the prosthetic biomaterial (0.7–1.4%), seromas (2.6–100%), postoperative ileus (1–8%), and persistent postoperative pain (1–2%). The incidence of enterotomy can be reduced by careful dissection and judicious use of any energy source. Infection can be minimized by the use of perioperative antibiotics, an antimicrobially impregnated biomaterial, and careful manipulation of the prosthesis during the procedure. Seromas are so common that they should be expected but can be decreased by the use of a postoperative abdominal binder. Aspiration will be necessary in a few instances. Similarly, ileus is expected when there is significant bowel dissection and bleeding. Early ambulation and standard use of postoperative bowel care will aid in the treatment of this problem. Persistent pain will generally occur at the site of a transfascial suture. It cannot be predicted or prevented with certainty. When it occurs, local injection with bupivacaine, steroids, or non-steroidal agents will help, but occasionally, removal of the offending suture(s) will be required. The average recurrence rate for LIVH is approximately 5.6% in the literature. Rates as high as 15.7%, however, have been reported. Recurrence will be increased by inadequate prosthetic overlap of the fascial defect, infection that involves the biomaterial, which then requires its removal, and lack of the use of transfascial sutures. 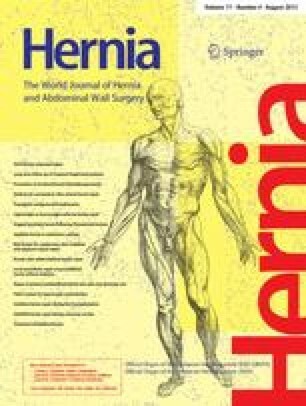 To prevent these risks, the surgeon must assure that there is at least a 3-cm overlap of all portions of the hernia defect and insist that sutures are used at 5-cm intervals to fix the biomaterial. Infection that requires explantation of the patch will generally result in recurrence, as this must be repaired primarily. Alternatively, the use of a collagen prosthesis may allow immediate repair, but this is associated with a high failure rate. A staged repair will be necessary in the future in most patients. Presented at the meeting of the American Hernia Society, Orlando, Fla. USA, in February 2004.